ART BY THE FERRY is a destination for tourists and visitors every June in Staten Island. Dance Central New York danced in front for the art work at the opening in 2009. the performance was very well received. Artistic Directors: Anne Matematico and Gina Valerio. Staten Island Creative Community is a not for profit, totally volunteer coalition of visual artists; photographers; musicians; performers; writers and film makers residing in Staten Island, N.Y.
SICC was started in 2008 by Joyce Malerba Goldstein and supported by the Council on the Arts and Humanities [COAHSI] as well as many local artists and business leaders. Our goal is to offer our coalition and others opportunities and support by providing venues and publicity for their creative endeavors. In collaboration with the business community, we take unleased spaces and turn them into temporary galleries, and performance spaces. We produce a multi media, two weekend festival in the area of the Staten Island Ferry called: Art by the Ferry. This production involves artists; photographers; musical groups; literary performers; street performers and Crafts tables. 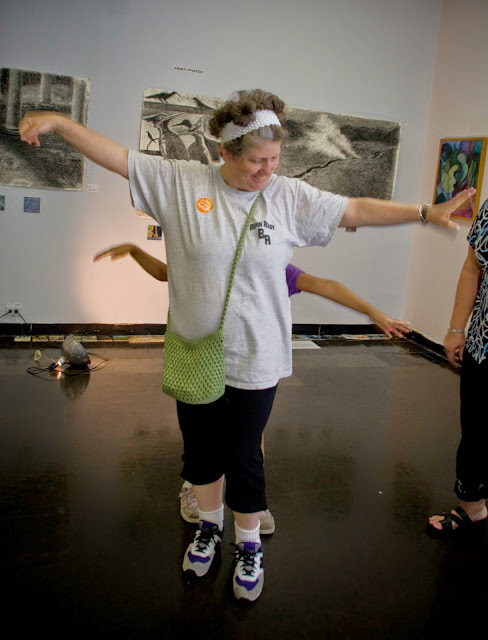 Many underserved groups perform or show such as “Lifestyles for the Disabled”; Liberian readers and Native American dancers. We promote this event by providing media exposure that attracts the general public of New York City and tourists visiting NYC from all parts of the world. A large number of Staten Islanders also attend. The 2009 festival attracted nearly 6,000 visitors. This influx brought an unusual amount of people to our local businesses including restaurants, museums, parks and exposed available real estate to a world wide audience. Our hope is to create an Arts District to attract and support the growing creative population and help stimulate the economic growth of Staten Island.